RG Ainslee continues the Secret Cold War Series with a fast-moving adventure in revolutionary Iran featuring Amado Ruiz and Jack Richards of the Raven-One Team. The Caspian Intercept combines historical events, intrigue, and high adventure into a fast-paced action thriller will have you burning through the pages. Packed with a cast of compelling characters and historical settings, The Caspian Intercept will keep you guessing with unpredictable twists and turns. 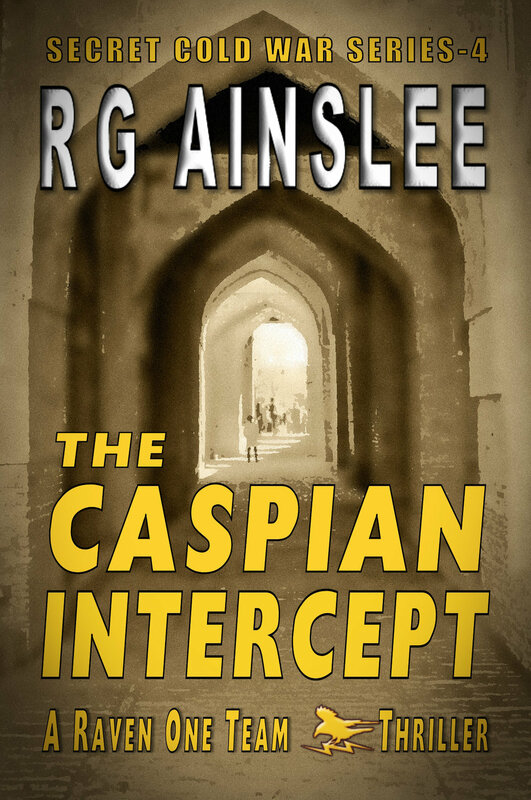 If you enjoy gripping thrillers loaded with suspense, action, and adventure, The Caspian Intercept is for you. A full length novel | Book Four in The Secret Cold War Series. End of October 1973, near Esendere, Turkey. The border was less than a mile away. We stopped by a stream to clean up before entering Iran. Little did I know that less than six years later, this would be the site of a dramatic escape from revolutionary Iran by employees of EDS, Ross Perot's computer services company. That story was chronicled in Ken Follett's book, On Wings of Eagles. Naturally, it had to serve as a location in the Raven-One Team thriller. 1. The events depicted during takeover of the American Embassy in Tehran. 2. The IBEX Project. The depiction of Site T-1 is a fictitious representation of the Tacksman-1 site operated by the CIA on the Caspian Sea in northern Iran.